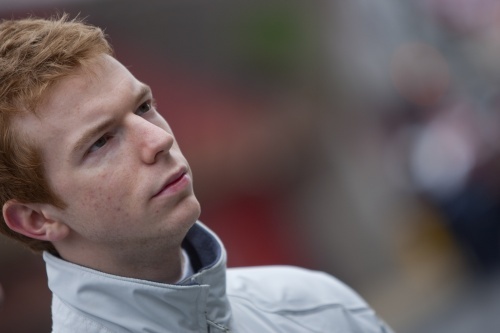 BRDC SuperStar Oliver Turvey is following in the tyre tracks of British F1 world champions Lewis Hamilton and Jenson Button after being snapped up by the Vodafone McLaren Mercedes team. Oliver took part in a special three-day testing session in Spain with the team last November, where he was given the chance to get behind the wheel of a F1 car for the first time, alongside the cream of motor racing’s emerging drivers. Now the highly-rated 23-year-old, from Langwathby, near Penrith, has been placed on the McLaren Driver Development Programme, which aims to nurture future F1 stars. The team has been monitoring Oliver since he won the McLaren Autosport BRDC Young Driver award, which recognises young up-and-coming UK drivers and whose past winners include Button, 13-time Grand Prix winner David Coulthard and current McLaren test driver Gary Paffett. Oliver, who will contest this year’s GP2 European Series – the feeder championship for aspiring F1 drivers – has spent the last few weeks working with engineers at McLaren’s technology centre at their headquarters in Woking, Surrey. The Cumbrian motor-racing star said: “McLaren have followed my progress since I won the award. “The testing session in Spain was part of my prize for winning the award but McLaren also wanted to test me. The test went well and they were impressed. I’m now working a bit more with them this season and they are trying to help me improve as a racing driver. “It’s a great opportunity for me and it’s a dream come true. I have model McLaren cars at home from when I was five. They are a team I have always dreamed of racing for. Oliver spent the winter contesting the GP2 Asia Series, finishing sixth in the championship, and is now preparing for the European Series, starting in Barcelona on May 8. He stepped up to GP2 after finishing fourth in last year’s World Series By Renault Championship and underlined his potential with a stunning victory on the streets of Monaco after leading from lights to flag. Capturing this year’s GP2 Series, whose past winners include former F1 World champion Hamilton, could land him a F1 seat next year. He said: “F1 teams look at GP2 for their next young drivers because the cars are so similar. The speed of a GP2 car on the straight is very similar to a F1 car. At the start of this year’s F1 season, there were 11 former GP2 drivers on the grid, which is nearly half the drivers. “The top three GP2 drivers from last year’s championships are now in F1.” McLaren has won F1 constructors’ championships and past drivers include Ayrton Senna, Alain Prost and Mika Hakkinen.